According to many resources, children are exposed more and more everyday to violence from the media as well as movies and real life. Children spend 80% of their time outside of school. 94% of the U.S. voters think that it would be better if children and teens are included in after-school activities that allow them to learn and experience new things. Do you Agree? Email us your thoughts! Objective/ Our Martial Art school’s provide Children's Personal Conduct Martial Arts Training to promote the excellence of Personal Conduct. This is a nationwide movement to educate 23.31 million parents who wish to teach personal conduct to their children. Circumstance / Children in America are increasingly exposed to violence in mass media and urgently need a personal conduct program; however, there is no specialized institute to teach a personal conduct program to children. Current Status / Personal Conduct Training is a natural extension of Martial Arts Training. Our Martial Art School's provide Special Curriculum based Educational Programs to day-care centers, gymnasiums and other after-school institutes. Strategy/ Our Martial Arts Schools are part of a nationwide movement to let parents of prospective students know that Martial Arts Training is a natural extension of Personal Conduct Training and lead them to nearby participating programs and schools. Tactics / Our Martial Art Instructors work closely with our students parents to increase the effects of the education of their children who are participating in our Curriculum Programs. Studies show that children learn better when their parents are involved. S.M.A.R.T. 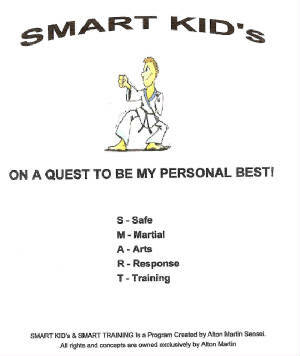 KIDS (Safe Martial Arts Response Training) is a program written by Al Martin Sensei in 1995 and used by his organization of Martial Art INSTRUCTORS that want to help make sure ALL children are safe. The people who are part of SMART KIDS are working every day to see to it that every child in every community and town learns how to protect themselves. There could even be a SMART KIDS program already in your town!! The SMART KIDS program will be spreading all across America and Canada. You might want to ask your parents to help you find out where the closest one to you is. Karate Incorporated's Focus program was created after recognizing the need for an alternative way for families to have their children taught the martial arts and other Safety skills, Life skills, and Stranger Awareness skills not focused on in most Karate school environments. Our Instructors go to your child's school, day care or pre-school facility or after-school program to teach our age appropriate programs in an atmosphere already familiar and comfortable to the child. Different age groups develop at different levels, so our children's programs are based on age specific curriculums that emphasize focus, balance, and hand and eye coordination, listening, following directions, life skills, respect and discipline, along with basic martial arts training. Children learn and retain information by way of repetition and positive reinforcement, all of which are incorporated in our programs. Best of all, there is no need to make special arrangements or rush your child to a martial arts class after work. We bring the class to your child. Our S.M.A.R.T Kids program focuses on peer pressure, bullies, daily stress, Stranger Awareness and all the values needed to deal with potential problem or situations that children may have to deal with, while still maintaining respect for their selves; and their decisions. For information regarding our Karate Schools curriculum for specific age groups, please see our Children’s Classes page on our Home Office Website.